I imagine a grand total of two of my readers will recognize the title of this post. (Hint: it's from RFC 5023.) But it seemed an appropriate title for a recent addition to a local office building where some Android developers tend to congregate. As a proof of concept for using the sippycode HTTP library which I wrote about in my last post, I decided to create a simple text console client for Twitter. Download the Twitter terminal application here. To try out this Twitter console app, unpack the download and run sippy_twitter.py. With it, you can update your status on Twitter or read the updates from your friends. When reading, the client displays five updates at a time, since showing more at once would likely cause some to scroll off the top of the screen (assuming the terminal displays twenty-five lines). This simple application was designed to be a proof of concept, but it's really grown on me. Cycling through all of my friend's updates doesn't require any scrolling, and it feels snappier than the web interface. It seems like others are enjoying this terminal client too. There are quite a few ways that this client could be improved, so there's plenty of opportunity to pitch in if you are interested. I have received feature requests from friends who previewed this app, such as: support command line arguments which will allow the client to perform updates when being run from another program, show a running countdown from 140 characters as you are typing your update (could probably be done using ncurses), ability to follow users, and read updates from just one user. If you'd like to participate in any of these, let me know in the comments. Fire up your terminal and give this client a try. Why not post an update to @jscud right now? At Super Happy Dev House 27, I made significant progress on an open source library for making HTTP requests in Python. For the past few years I've been working with web services and APIs (SOAP, REST (wikipedia) - specifically AtomPub, etc.) and I wanted to create an HTTP library which is simple, clean, and precise. Python has a couple of great HTTP libraries already, but one of them is a bit too low level (httplib) and the other is too high level (urllib2). For example, in httplib you call a method to send data as if you are writing to a file (httplib uses sockets, after all). Required HTTP headers like Content-Length are not calculated for you. You'll need to handle cookies and redirects on your own. On the plus side, you get full control of what is being sent. The higher level library, urllib2, is built on top of httplib. It adds some handy abstractions, like calculating the Content-Length, but it also has some limitations. I haven't yet been able to figure out how to perform a PUT or DELETE with urllib2. # Sets the request's Host, port, and uri. To use the above, you have to gather all of the information in one place, and make the function call. There are cases where you want a design like the above. The photo posting example from above could look something like this. Keep in mind that these steps could be carried out in a different order in different segments of code. In fact, the above code could make up the body of the post_photo function described in the first code snippet. I created an open source project for this and other small projects called sippycode (a play on sippy cup). This is a place where code can grow up. I've used screen for a few years now, but I only recently learned about one of its highly helpful features. As I was using my XO laptop in text only mode (ctrl-alt-fn-2), I was using screen to simulate multiple terminals, and I needed to copy and paste text between them. In the past, I've usually used screen when ssh-ing into a machine, and putty (my ssh client of choice) provided copy and paste, so I had never needed screen's system. It turns out, screen's built-in, cross-window copy-paste system is a breeze to use. Press ctrl-a [ to enter copy mode, press enter to mark the start point and enter again to mark the end point. You have now copied the text. Switch to the desired window, and paste in the text using ctrl-a ]. This feature is especially handy in the XO laptop, where I've never been able to figure out how to copy and paste in the Terminal Activity. For me, screen's most useful feature has been the ability to detach and reattach to a session which continues to run on the server. If I lose my ssh connection, all of my processes continue to run, and I can reattach to my screen session as if nothing ever happened. Screen can be difficult to understand if you've never seen it in action, so I recommend watching this video. You can also learn more in this tutorial. One Laptop per Child is launching its second 'Give One, Get One' (G1,G1) program starting in November, 2008, delivering its XO Laptop globally via Amazon.com. Although the first iteration of the 'G1G1' program was extremely successful and sold more than 185,000 laptops, the delivery of the laptops in the USA did not run as smoothly as we anticipated. Selling the laptops on Amazon.com will provide us with the resources to process and ship the laptops globally in a timely fashion. As for running in text mode, I've settled for using the terminal by pressing ctrl-fn-alt-1. To switch back to the normal view. press ctrl-fn-alt-3. For some reason, I can only start screen as root. I also added a function for ARC4 encryption, which doesn't provide strong security, but it is still used in some places. I'm slowly starting back up again on my note taking wiki application. I created my own version of TiddlyWiki several months ago, but then started working on other projects. I'm planning to rewrite my note taking Ajax application to run on Google App Engine, and as I was getting started I realized that there were a few things missing from the Ajax library that I had written as part of this project. I've also added a minified version of the q12 library, it weighs in at a mere 10k. Download the library today! I recently created an App Engine app to run www.jeffscudder.com. At the moment the code is extremely simple, and I get so few visitors to that web page that I doubt I will need anything complicated. With those design goals in mind, I set out to create my super simple content management system. It runs on App Engine, and the admin (me) is able to sign in to a special secret /content_manager page which lets me assign a specific blob of text to the desired URL under my domain. I can also set some basic metadata, like the content type (so that your browser knows how the content should be rendered) and cache control information, since HTTP caching is excellent and saves puppies from drowning in lakes (ok seriously it will alleviate congestion and unnecessary traffic when you want to give the same content to thousands or millions of people). I've also decided to open source the code and I called the project scud-cms. Since App Engine is free for you to sign up, you can just upload this code and start setting your own content from right there in the browser. No I'm not talking about singing. 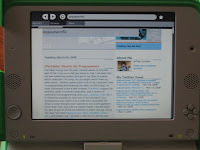 As momentum was building for Firefox 3, I started to hear good things about Opera 9.51. When I ran into performance issues on Firefox and the XO, I decided to give Opera a try. Some thought I was crazy since, as Arne mentioned, the XO can be a bit slow. Yes, the XO laptop is a different environment than most other computers out there, and Opera has turned out to be an improvement. To set up Opera on the XO, I began by downloading from the Opera web site. 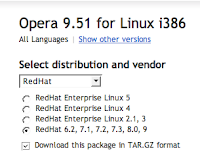 I selected Opera 9.51 for Linux i386, selected RedHat as the distribution in the drop down menu, then I selected RedHat 6.2, 7.1, 7.2, 7.3, 8.0, 9 and checked the box to Download this package in TAR.GZ format. Whew. From there, you can just type opera on the command line in the terminal to start it up. The comments on my previous post were highly enlightening. Joe pointed me to an article on the Polymorphic Inline Cache, and it's use in the SELF programming language. And Joel mentioned some different techniques used in other languages (Objective C, LISP, C++, and others) to implement dynamic lookups. With this new information, I can see that my simple solution might fall far short of the optimal solution, which isn't all that surprising as I'm certain more time has been spent on these real programming languages. But what I do think is interesting, is the idea that a more complex solution can give better performance than a simpler design. It is as if there is a valley, with the simple solution of static, precompiled behavior on a peak of performance, standing opposite a complex design which introduces overhead of collecting statistics on the most common paths through the code and constantly recompiles to machine code which optimizes the most used idioms. In between lies the poorly performing trough of the half solution. Solutions which provide dynamic behavior, but don't go far enough to mitigate the added cost of runtime lookups. The simple idea that I've coded up sits in this trough of slowness, but I'd wager it is faster than some solutions I've seen out there. This isn't really a great solution, but I had already started, and wanted to finish because I think it was a good learning experience. We begin with a definition of a data structure that points to an offset lookup method. With the data structures in place and the functions which map member names to locations, we can now write functions which dynamically lookup the location of a member. This simple function displays the age of the entity which is passed in. The static variables are designed to speed up repeated calls with the same type. For example, if a Person is passed in as entity several times in a row, the location of the age member will only need to be looked up on the first call. Here is a program which uses the above structures and functions. When the above is run, it should display "I am 4 years old". Now, what is the point of all of this? In statically typed, compiled languages, the compiler usually has to know in advance where the data is and what it's type is. For example, with the Dog structure, the compiler knows that age is 12 bytes from the start of the structure (on most 32-bit processors), and that it's type is int. All of the offsets are calculated at compile time. By moving the offset lookup into a function which is executed at runtime, we free up the compiler from having to know where to look for a particular member. Now we can pass in any data type into GiveIntroduction and as long as the object's memberLookup function tells us where to find the age member, everything will work. We've gained flexibility at the cost of some overhead. Setting the memberLookup on every instance of a TypedStruct uses a bit of memory, and calling the function to find the necessary offset adds a runtime cost. This example has been a bit simple, even too simple, as there are ways to provide more aggressive caching of the lookups and faster ways to perform the lookup within the XLookup functions. If my senior class had voted for a "Most likely to try to invent a new programming language", I probably would have at least gotten a nomination for the category. From time to time I think about how I could design language constructs that maintain efficiency while allowing for more flexibility than statically linked, early bound languages like C. Some of my previous posts have been along these lines. And I've recently been thinking about performing member lookups on an object instance and how I could write a more flexible object system in C.
Now when you say Person fred, your program will grab a chunk of memory (likely from the stack) that is 8 bytes, or 12 bytes, or something similar depending on the compiler, size of pointers, ect. Now if I write fred.age in my program, this is translated to "the value of the two bytes at the start of fred's address" and if I ask for fred.weight, that turns into "the value of two bytes which are at exactly fred's address + 2". Since C is early bound (AKA static), the compiler knows that weight is always found in the same location relative to the start of fred, and as a result, the machine code generated by the compiler can be very fast and efficient. Now if I want to reuse the code I wrote earlier to find out the age of a Dog, I have a small problem. You see, the age is in a different location for a Dog than a Person. If it had been in the same position, I could have cast the Dog to a Person, and then my compiled code would be looking for age at the same location. But for one reason or another, the layout of Dog is different. In many programming languages, the difference in layout would present no problem, because the offsets aren't set in stone at compile time. Instead there is a dynamic lookup which says "where can I find 'age' for the type of data this is?" and we can add the same functionality here in C. Often this lookup is done using some kind of associative array, but I have a few slightly different ideas in mind. C gets around this potential limitation by requiring you to specify the type of the each chunk of data. So for example, if you have a Person fred and a Dog nelly, then age is converted into a different offset from the start of the data. However this means that you would need to write the same function multiple times, once for Person and once for Dog. In order to accomplish a dynamic member lookup, I'll add one thing to the types I've defined above. The first member will always be a pointer to something that allows the location of a named object to be determined. This could be a function that takes a name and produces an offset, it could be a hash table that maps names to offsets, it could point to a binary tree, or something else. // performance by avoiding the need to perform a lookup in some cases. I haven't decided yet on the best way to lookup the offset based on the member name. I think it might be a close call between pointing to a lookup function with if statements, and a lookup in a presorted binary tree. Depending on the number of members, I could see it going either way. What do you think, what is the best way to implement a dynamic member lookup? In a previous post, I mentioned that I had designed a simple password generator for use with the myriad of websites on which I have accounts. Rather that store passwords and carry them around with me, I've decided to carry around the code for a password generator in my head, so that I can generate difficult-to-guess passwords using a few easy to remember pieces of information. Namely these are a reusable master password, my username on the site, and the domain name of the site (like twitter.com for example). The generator algorithm takes these three pieces of information as strings of text (ASCII characters to be exact), and uses them to populate three pseudo-random data streams (I used ARC4 for the pseudo-random algorithm because it is easy to memorize). These three streams are combined to create the characters in the password. For more details, see the list of steps in the first post about the password generator, or better yet, take a look at the source code. I have uploaded the password generator here, so if you'd like to use it, feel free. In order to account for some websites which do not allow special characters or passwords that are thirty characters long, I created a settings file which has special rules for some websites. If there are any websites that you would like me to add to the settings, please let me know in the comments. Now for a disclaimer: I'm not entirely sure that these passwords would stand up to cryptanalysis. It might be possible to figure out the inputs (the three secrets). So I recommend just using it for websites which are not too sensitive. I'm just using it on social news websites at the moment. Someday this might all be made unnecessary through the use of OpenID or some other authentication solution. I'm looking forward to it. 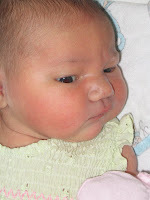 Our daughter was born June 23rd at 2:29 AM and weighed in at a whopping 9 pounds, 3 ounces. She was 20.25 inches long, so it seems like Trevor was closest with his guess. She's absolutely wonderful. 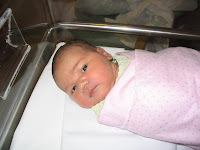 For now, we're quite busy keeping up with her, so I don't anticipate much writing in the near future. The first picture (Claire sleeping) was taken by my good friend Matt. My most recent little side project is a web page for generating passwords. It's a very simple page, which takes a few inputs, generates a pseudo-random stream from them, and produces a password using printable characters. Now now, hold it down. I can hear you from way over here. "But Scudder, aren't there like 40,000 password generators out there? Won't a web page be much slower at complex calculations than an installed desktop application? Wouldn't a truly random password stored in an encrypted keystore be a more secure way to handle passwords?" Well yes that all tends to be true. The idea here though, is to be able to regenrate passwords that I use non-critical accounts (you know, for sites like digg.com and reddit.com) on whichever computer I happen to be using. In fact, even if this password generator web app is for some reason unavailable, I made sure that it is simple enough that it all fits in my head. In a pinch, I could rewrite it from memory. Ask for a username, password, and domain (like example.com). Generate an RC4 stream for each of the three inputs above. Throw away the first 1,000 bytes from the three streams. Get three sets of the desired number of pseudo random bytes, one for each key stream. And xor each group of three bytes together to get single pseudo-random values. For example, if you want a 15 character password, get 15 bytes from each of the three keystreams. Translate the bytes into printable characters, or alphanumeric characters, by taking the modulus of the pseudo-random byte and using it as the index to looking up a character in a table. A couple of the items above need some clarification. First is RC4. RC4 is a well known algorithm for generating a pseudo-random stream of bytes. It's not really up to snuff in terms of high security these days, but it is really simple. So simple in fact, that it is easy to remember the steps, and therefore, I chose it for this all-in-my-head password generator. It turns out that some websites don't allow special characters like % and & in passwords. Why they don't is beyond me. So I created a table using the same method as above, but it only contains alphanumeric characters. Like this 1234567890qwertyuiopQWERTYUIOP... For websites which don't allow special characters, you can choose to use the alphanumeric table to translate the pseudo-random bytes into a password which is usable on the website. I must sign off for now, so stay tuned for part two. I imagine most of my regular readers have already found this out through other channels, but we're expecting. (Really it is Vanessa who is expecting, I have never really figured out why people say "we".) The bouncing baby bundle should be arriving in the very near future, so we've decide to guess the delivery date, weight, and length. The due date is June 22 and the doctor will usually try to induce labor if the baby hasn't arrived a week after the due date. Please write your own guess in the comments. The person who guesses the closest may receive a major award. Over the past year, we've been remodeling our first house. It has been a very big job encompassing every room, and we did most of the work ourselves with help from family and friends. We hired out for some of the more complicated tasks, and we could not have done this without the help of many people (thank you!). 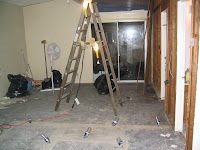 I have a few hundred pictures of the entire remodeling process, so I thought it would make sense to show just a few pictures from the living room. 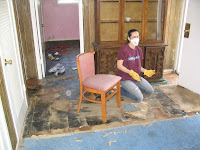 We began by removing all of the carpet in the house. In this first picture. you can see the front door as Vanessa is cleaning the floor. 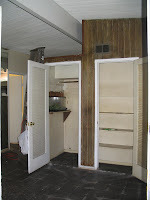 The rest of the pictures are taken from the front door (on the right) looking towards the back door (to the left). When you first walked in the front door, you used to see this big structure which contained a couple of closets and was made of wood paneling. 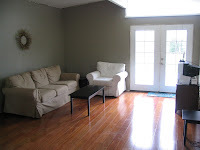 It created a short hallway which you would walk through to get to the living room from the front entry. We decided to remove this completely to create one great room. Fast-forward ahead a few months, and we have hardwood floors, new drywall, paint, and we're moved in. The master bedroom was actually the first room we finished, followed by the kitchen, then this, the living and dining room. I'll probably post more pictures at some point in the future. There are still a few details left to do, but the big remodel is basically finished and it feels very very good to be so close to completely done. So many posts related to programming recently. Time to change it up. because sometimes you fall flat. What do you call a joke that stinks? What's another name for a beach bum? What is equivalent to sine divided by cosine? And what is an .so file you might ask? Those from a Windows background might know them as .dll files, but that still doesn't answer the question. Normally, when you compile a program, the system takes all of the pieces of code that you've written, converts them into something the computer can understand (machine code) and glues them together. You might compare the process to building a pyramid. All of the stones that you've sculpted are joined together and stacked up. Just like with a pyramid, if you want to change one of the stones, everything that sits on top of it needs to be adjusted. With a C program, making changes in a piece of code means lots of pieces need to be recompiled and reglued together. If you use dynamic linking, shared libraries, whatever you'd like to call them, things work a bit differently. With dynamic linking, the pieces are not all glued together or stacked up, instead they are plugged in when they are needed. As a result, changes to a piece of code don't require that lots of other pieces get reshaped (recompiled) to fit. With dynamic linking, it is possible to change a piece of code while the program is running. Funny, that sounds a bit like a scripting language. Now I write a program that uses this library. Here's the normal, non-dynamic, static linking, built like a pyramid way of using the library. // Obtain the address of a function in the shared library. // Use the dynamically loaded function. For an explanation of what the above compiler options mean, and further explanation on .so files, see these two IBM articles on using shared object files on Solaris and linux. Learning about .so files has been very interesting to me, because they bring a new level of flexibility to a traditionally rigid environment like C.
So where does this flexibility come from? One place I tend to notice it most, is in the ability to give an existing function a new body, in other words, you can plug in different behavior in place of the default. After adding the above code to the foundation we started with, you will notice that the calculate total method now uses calculate-higher-tax instead of the original function, even though you are calling the same method on the same object as before. Congratulations, you have just witnessed late binding in action. So what is late binding? The idea is that the computer decides which code should be executed while the program is running. This seems normal in scripting languages, but compiled languages often use this too (I'm looking at you Java and C++). For example, overloaded methods and polymorphism take advantage of late binding. With late binding you can change the meaning of an identifier (for example, change the behavior when you call a specific function) at just about any time. Now lets take a look at a language which uses early binding. C is a great example. With early binding, the meaning of things like function names are locked in when the code is compiled. There is no dynamic lookup while the program is running to see which code should be executed, instead the address of the desired code is embedded directly into the binary machine code. If you try to set CalculateTax to a new function definition, you will get an error at compile time because a function cannot be changed once it is bound. Early binding tends to produce more efficient programs. However, if you want to, you can still use the flexiblity available in late binding in C.
Here's another way to think about this comparison. In high level languages which don't expose pointers, functions, variables, and other identifiers actually act like pointers. Last week, I downloaded the beta release of Ubuntu 8.04 (Hardy Heron) to give it a try. I've been meaning to migrate our last Windows XP machine over to Linux for some time now (the other three computers I use regularly are Linux machines), but I've been reluctant to backup, repartition, and take the plunge. It seems like this is a common feeling among computer owners, but I think the Ubuntu community may have found an effective solution. And the name of this new innovation: Wubi. Pop in the Ubuntu CD while running in Windows, and an auto-run installer opens which allows you to install Linux alongside Windows. When you reboot your computer, you see a menu of which operating system to boot into: Windows or Ubuntu. This means you can try out Ubuntu on your computer with zero risk to your existing files. In fact, you can access the files on your Windows installation from within Ubuntu. And if you decide Ubuntu is not your you, you can uninstall it as you would any other Windows program. Pretty slick. Managing in the installation is just the beginning of the improvements the team has made. After I installed the latest version and booted into Ubuntu, it told me that there were propriety drivers for my NVIDIA graphics card and asked if I wanted to install them. I clicked the button, the download started, and I was up and running with 3D accelerated graphical desktop effects. I think I could sit there opening and closing windows all day. I'm looking forward to the upcoming official release. I've been listening to Daft Punk and Justice quite a bit recently. Apparently I'm on a techno kick again. I've never found any electronic music that I've enjoyed as much as Joy Electric's The White Songbook. The purity of the tones and style has made it one of my all time favorite albums. In the above example, the first play statement will be executed, then the third play statement (5 bars into the 8 bar intro), then the second solo will play again, probably before the first solo finishes. There are other interesting features in the pseudo-code above, but the fact that these sequences are played out of order was what I really want to highlight. I've done live coding at several events over the years and I tend to have fun with it. It doesn't always go exactly as planned, but that is the whole idea. Live coding turns programming into a performance piece. I imagine there is a niche group of people who could really get into the live coding music scene. 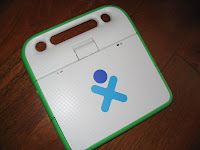 My XO laptop arrived in the mail recently and it is quite an amazing little machine. Conclusion up front: I'm extremely satisfied with it and in some ways this laptop computer is better than ones that sell for ten times the price. You might recall from a previous post that I had downloaded the XO's operating system and taken it for a test drive in an emulator. Now I have the real thing in front of me, and it's safe to say that it is even better. After all, some of the most innovative features of this computer are in the hardware. My favorite feature is the screen. It is viewable in direct sunlight which makes it usable outdoors. Second up would be the wireless networking. The graphical network selector is fun to use and the connection tends to be more reliable than any of the other computers I've used with my home wireless router. The battery life is also impressive, easily five hours on a charge of its small battery. It even has a built-in camera and microphone. It runs all of the software I need too. I used the instructions I wrote up when I installed firefox on the emulated operating system. Everything went smoothly and I was browsing the web using firefox in a few minutes (The XO laptop comes with a perfectly good web browser, but I wanted to use my favorite plugins and have more control over downloads). I'm quite taken with the little machine. I've been using it as my primary computer at home, using it for all of the tasks I normally do (mostly browsing the web and programming). There are a couple of things that I would change if I had the chance. The first is the keyboard. It is an interesting design, made of a flexible rubber-like substance, and it works much better than other flexible keyboard that I've tried, but it took a while to get used to the shift key (I have to press in the corner of the key). The other difficulty is presented by the slower processor, but it doesn't get in my way most of the time. The only time I notice any slowness is when playing flash videos (like on YouTube). Perhaps part of the problem is flash for Linux, but I'm not sure. In any case, I don't really mind as I don't watch that much video, and if I want to, I have other computers that I can use. It will probably come as no surprise that I wrote this post using the little green computer. I'm saddened by the end of the "give one get one" program, as I think there is still the opportunity for more people to donate and receive their own XO. If anyone is interested, it might be possible to order a batch of one hundred or more through the "give many" program. Andy and I started work on a simple little open source project for tracking tasks; it's called busylist. We wanted to experiment with Ajax, Python, and web service APIs, so we whipped up a basic system in a few hours. There is still quite a bit of work to be done, but it has been a great learning experience so far. An extremely alpha test version is available in subversion along with some instructions on the project's wiki pages. 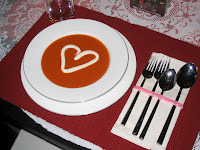 If you're interested, feel free to check it out (pun intended) and contribute if you like. It is an open source project after all. I've been trying over the past several weeks to find the best fit for Linux on a USB pen drive so that I can boot into my own operating system and get to my files no matter which computer I'm using. As you might notice from my other posts, I tend to spend quite a bit of my computer time in programming and browsing the Web, so the things I'm most interested in are a web browser (Firefox), support for wireless cards in several computers, and a variety of command line programming tools (gcc, python, vim, etc.). It should be possible to take one of the standard Linux distributions and install it on a USB drive (provided the drive is large enough), but I wanted to use a one gigabyte drive that I had, and with my simple needs I should really be able to get all of the necessities in under one gig. Along the way I've tried Puppy Linux, Slax, Feather Linux, DSL, and others, but I decided in the end to roll my own solution based on Ubuntu. I'm a big fan of Ubuntu, but the standard desktop install is far too large for installation on a one gig drive. For a while I was using the live CD booting from a pen drive with a partition for my files. I used the instructions I found on Pen Drive Linux to set up the pen drive with the image from the live CD (only 750 megabytes). The only problem with this set-up was that all of my files were in a seperate partition and my home directory was wiped out each time. Since many Linux programs store settings in your home directory, this turned out to be a bit incovenient. I tried a few different options, but finally decided to go with a stripped down Ubunutu foundation and add the things I wanted. In the past I've worked quite a bit with Fluxbox as a window manager, but it seems like iceWM is easier to configure, especially under Ubuntu. The liQuid theme looks quite nice. This set up boots into a text only command line mode because it is based on Ubuntu Server, to enter graphics mode, you simply run startx. I connected to my wireless network using wpa_supplicant and running iwconfig. One of the benefits of working on a lightweight system on a flash drive is the bootup speed. In twenty seconds the computer boots from a cold start, connects to my wireless network, and enters the graphical desktop. I'm quite happy with my little portable operating system, and you probably won't be suprised to hear that I wrote this post using it.